Kambu is known as 'Pearl millet' in English and 'Bajra' in Hindi. It is very healthy and highly nutritious. Despite its high nutritional value, it has long been considered a poor man's food. Now it has made a come back due to the growing awareness about millets. Bajra is non glutinous and is full of vitamins and minerals. It is also rich in proteins and fiber. Being rich in fiber, it helps in weight loss as it keep you fuller for a longer time. This kambu koozh is known to cool the body, so it is considered a perfect drink during summer. Today we will learn how to make kambu koozh following this easy recipe with step wise pictures. Wash bajra/kambu well and drain the excess water. Let it sit for 15 minutes. Then grind the kambu coarsely. Add 1 1/2 cup of water and pressure cook for 3 whistles. You can also cook in a pan with lid until soft. Once the pressure subsides, open the cooker, mix the content and leave it to cool. Once cooled, make balls and keep them in clean water until use. 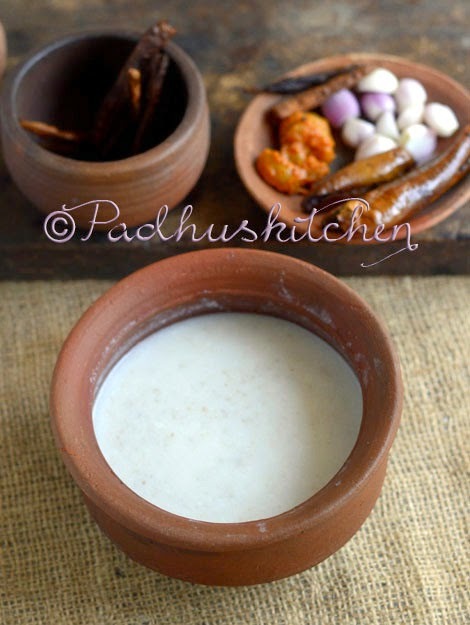 To make kambu koozh, dissolve a ball in little water (you can use the water in which it was soaked), add 1 cup of butter milk or as required, water and salt needed. Mix well and serve with pearl onions or vathal. The most common side dish for kambu koozh are pearl onions, green chillies, vathal, mor milagai, vadam or any pickle. You can keep the balls with the water in the refrigerator for 2-3 days and use it when needed. To make kambu koozh with kambu flour - Mix 1/2 cup kambu flour with 1 1/2 cup water and cook on medium flame stirring continuously.Once it starts thickening (like porridge)remove from heat. Allow it to cool. To make kambu koozh, mix it with needed water, buttermilk and salt. Serve with pearl onions or mor milagai or pickle. Note - I got pearl millet from health stores and used it as such as shown in the picture above. You will love my Kambu Dosa Recipe also. very healthy and a perfect coolant for this scotching summer!! Cook the kambu flour on medium heat stirring continuously until it starts thickening. Perfect summer recipe.nice illustrative clicks. Hi padhu I am looking for tis dish.....thanks for posting it. hi padhu,I love all the dishes which you post. A desperate follower of your blog. Got a small doubt. can we keep the balls in water overnight and make koozh out of it the next day morning as we do white rice? Thank you Arundhathi for liking my blog. Yes, you can keep the balls in water overnight in the refrigerator. hi, i have a doubt while cooking kambu kuzhu no need to add rice, like how we use to prepare with ragi flour. and do we need to soak the flour overnight or we can prepare this at any point of time. Deepika - If you want, you can add rice and cook or add cooked rice but it is optional. You can prepare koozh without soaking the flour overnight as I have done it. But I have read that soaking the flour overnight increases its nutritional value. Second thing i tried kambu koozh today as said above but there was deposit in bottom of the pan top layer was good. Can you tell me what mistake i had done. I think you have prepared with kambu flour. You can use non stick pan to prevent that or you can slightly grease your pan with oil. This will help to prevent kambu flour from sticking to the bottom of the pan. Actually in the grocery shop, there are two types of kambu. One type was without a tail-structure and the other type was with a tail-like protrusion, which costs a little more. Which type is suitable for this koozh preparation? Ragi and Bajra produces heat in body when consumed in any format. But placing it in water overnight (not in fridge) not only increases its nutritional value but turns the food into a body coolant. Kambu or ragi koozh is best eaten after soaking it overnight.